Pop Tab Pandemonium ended April 28 and this year we gathered approximately 4,500 pounds of tabs from 40 schools across the state! We really appreciate every student who worked hard to collect pop tabs and the teachers and staff who helped guide them throughout the year. These efforts will help us ensure our doors are open to help families when their child is receiving medical care! Congratulations to all our winners! 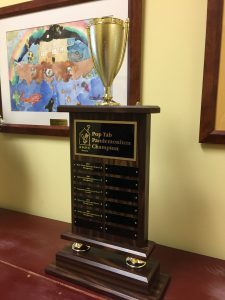 Each winner receives a special plaque commemorating their efforts and we have presented our overall winner with the traveling trophy. 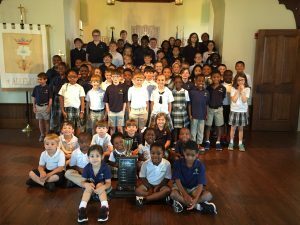 Holy Cross Episcopal School has collected tabs for RMHCA for several years now but staff say the students have a greater understanding of the mission because of a very personal connection. Holy Cross students Robert and James have family who stayed at a Ronald McDonald House. Their aunt and uncle live in Sea Grove Beach, Florida and took the over two hour drive to take their newborn baby Elizabeth to the hospital in Pensacola and they needed a place to stay. “Staying at the Ronald McDonald House in Pensacola meant that they didn’t have to drive back and forth such a long way to see about their small baby,” James said. James also added that the Ronald McDonald House not only provided a place to stay, but also provided their meals and helped them like they were a part of their own family. Robert and James both said that they are so happy that Ronald McDonald House helps families just like their family in so many different cities and places all across the country. We are so glad to hear that Ronald McDonald House Charities could make a difference for Robert and James’ family. Their story illustrates how important the mission is of RMHCA and each Ronald McDonald House Chapter. Are you fired up to become next year’s Pop Tab Pandemonium winner? Registration for next year’s Pop Tab Pandemonium contest opens September 1, 2017. If you’ve been thinking about registering your school for the contest, click here to learn all about it!